After the bloated and unsatisfying first instalment in the Hobbit film series left many frustrated and disappointed, it comes as a relief to discover that its follow-up, subtitled The Desolation Of Smaug, is a considerably more forcible and pleasing romp. It’s fun and spry, with a bulging sense of adventure and urgency that excuses a vast majority of the more superfluous moments. Peter Jackson’s penultimate return to Middle Earth feels as much like a piece of The Lord Of The Rings saga as one could hope. Thorin Oakenshield (Richard Armitage), his band of merry dwarves and Bilbo Baggins (Martin Freeman) continue their quest to reclaim the lost kingdom of Erebor from the fiery clutches of fearsome dragon Smaug (Benedict Cumberbatch). First, however, they must cross through the forest of Mirkwood into Lake-town, all the while dealing with the absence of Gandalf (Ian McKellan) and confronting the many forms of evil – from man-eating spiders to marauding orcs – that lie in their path. There’s much to be entertained by in The Desolation Of Smaug, with much of its run time dedicated to heart-thumping action sequences and dramatic face-off’s. It may be that our hero’s have an end point and purpose in place this time around (their escapades here are far more consequential than those beforehand), but there’s plenty of action and adventure to be had along the way. This allows director Peter Jackson to let loose and and be more playful, employing one set piece after another in an effort to test our protagonists. The set pieces in themselves are tremendous. But it’s the fact they’re set to Howard Shore’s pulsating score and captured by such wonderful camera angles that makes them so terrific. 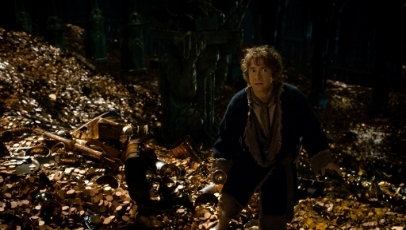 After a while though, the episodic structure of the narrative stars to wear thin, meaning that when the final battle against Smaug does come along, it’s been scrubbed of much of its menace – the same can be said for Cumberbatch’s altered voice, too – in favour of a momentous cliffhanger of an ending. It’s annoying also that Freeman, though distinctly more comfortable as Bilbo this time around, is used so sparingly. His own personal voyage and the effects the newly discovered ring have on him are left to the sidelines. An increased presence would have perhaps made the Necromancer’s manifestation more ominous too. Instead, The Desolation Of Smaug is a surprisingly breezy and well crafted fantasy that’s more necessary and rewarding that what came before, yet still somewhat irksome in its overlong and frivolous form.